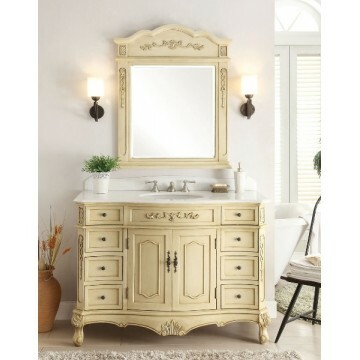 This 48” creamy beige finish Fairmont bathroom vanity has a traditional antique look with ornate molding throughout. Center cabinet doors open to large interior storage with one shelf, dual columns of drawers provide ample storage space. The trim and the scrolls motif display exquisite beauty, with outward Victorian style feet and deep cut decorative base, the beauty stands out. It is a piece anyone would fall in love with. Striking crystal white marble countertop is made of the highest quality that will resist prolonged exposure to humid conditions and long life durability.